I still remember how I was struck by Metropolitan Vladimir’s sermon. Archpriest George Kovalenko, Head of the Informational Department of the Ukrainian Orthodox Church, shared with a Pravmir reporter his memories of the late Metropolitan Vladimir of Kiev. The first time I saw His Beatitude, Metropolitan Vladimir, was during the church service on the feast day of the Holy Trinity in 1993. It was his first feast day of the Holy Trinity in Kiev, in the Kiev-Caves Lavra. 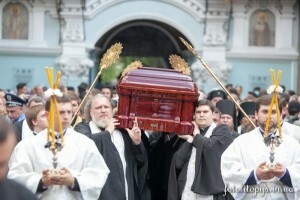 I was then a student of the University of Kiev and came with my friends to this service at the Lavra. I still remember how I was struck by Metropolitan Vladimir’s sermon. He related the story of St. Augustine. The sermon struck me because it was addressed to all who were standing in the crowded church, and it was equally clear to all: to the professors and students, as well as to the simple babushkas. Later, in 1997, when I began to engage in informational activities, we came to His Beatitude for a blessing to open the first website dedicated to religious topics of the Ukrainian Orthodox Church. We presented the information to His Beatitude in the format of a printed “online book.” His Beatitude blessed us to open the first official online resource of our Church. Later, when I became His Beatitude’s press secretary, Metropolitan Vladimir set an example for me of how to be an educator and missionary – someone who is, on one hand, meek and humble; and, on the other, strong and confident in what he is doing. He never refused to provide comments to the media; he never refused an interview. There were cases when we stopped the procession in the Svyatogorsk Lavra so that His Beatitude could go out to the reporters. During church services at his ceremonial entrance, he would turn for a moment to the cameras and make comments, thereby fostering a certain culture of communication with the media between the clergy and the laity. His Beatitude read a lot. The doors to his office were always open on two sides, and one could enter and leave wherever it was more convenient. His Beatitude would daily walk around the Lavra’s territory, talking with both parishioners and clergy. I think that in these past twenty-two years, during which His Beatitude was the Primate of the Ukrainian Orthodox Church, a new generation of clergy, episcopate and laity has evolved. In fact, our Church today is the fruit of the labors, prayers, and deeds of Metropolitan Vladimir.